The Linksys RE6700 AC1200 Amplify Dual-Band Wi-Fi Range Extender is the latest range extender from Linksys with 802.11ac technology and a plug-in format factor with a built-in power outlet that allows the device to plug into a power outlet while providing an extra outlet for other electronics. With up to 10,000 sq. ft. coverage, it lets you repeat the wireless signal of any access point or router to provide internet connectivity in hard-to-reach areas through a wireless connection on the 2.4 GHz and 5 GHz frequency bands. The Linksys RE6700 also offers the option to use it as a wired range extender (Access Point mode) or a wireless range extender (Range Extender mode). Cross Band technology that maximizes simultaneous use of both 2.4 GHz and 5 GHz bands for high speed data transfer and uninterrupted streaming and gaming. 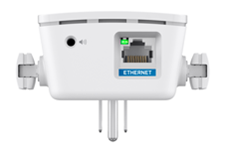 ETHERNET port – This port is used to connect wired clients such as computers or media servers when the Linksys RE6700 is in Range Extender mode or connect to a router when it is in Access Point mode. Audio port – Supports 3.5 mm audio jack. Allows connected powered speakers to play music via Digital Living Network Alliance (DLNA®) or AirPlay®. QUICK TIP: If your Linksys RE6700 is solid red, unplug the extender and move it closer to the router. On the other hand, if it is flashing red, simply unplug and reconnect the extender.